BreathAdvisor is a great addition to any event that serves alcohol to guests. Our standard kiosks are housed with a portable stand that allow us to bring the breathalyzer to any locations with a power source! Our services include the educational kiosk and also staff to assist your guests and inform them of the importance of knowing before you get behind the wheel. Only $225 per machine per event! 1. What kind of events is this best suited for? 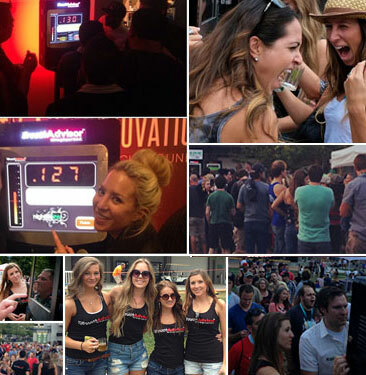 The BreathAdvisor kiosk is suited for all types of events that involve alcohol consumption! We do everything from weddings, to beerfests, to private parties and corporate events. We can even brand the machine however you like! 2. Can I still be held liable for any damage caused by a drunk driver? While having the kiosk present at your event will greatly reduce the chance that someone will knowingly drive intoxicated we cannot eliminate your basic liabilities that are inherent with serving alcohol. 3. Can my guests request a cab from your machine? Yes! The only thing we require for this is an active internet connection. 4. What's the limit on the BAC (Blood Alcohol Content) results? We default the limit to .20 which is over twice the legal limit. If you'd like this lowered even further we'd be happy to set the limit at whatever you like! We charge $225 per machine for each event. This includes the branding of the machine and free usage for your guests. Provide a valuable service while adding more entertainment for your guests! Informed Guests Make Informed Decisions.